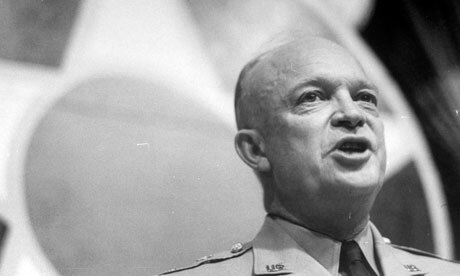 Rethinking the Eisenhower Memorial: what is a fitting tribute to Ike? By comparison with the bitter battle over the new Memorial to the airmen of Bomber Command in London’s Green Park, the battle over the proposed new Eisenhower Memorial in Washington, DC has been mild. The Eisenhower Memorial does not come with the explosive issue – the second world war carpet-bombing of German cities – that has colored debate on the memorial to the airmen of Bomber Command. The architectural fight over the Eisenhower Memorial is, nonetheless, one of enormous seriousness. Dwight D “Ike” Eisenhower is the military face of the second world war for most Americans, and this Fourth of July there will be no celebrating the start of his long-overdue memorial. The US secretary of the interior wants more time to study the latest models of the memorial, and if Susan Eisenhower, Ike’s granddaughter, has her way, the controversial Frank Gehry-designed memorial will never be built in its present form. In language unlike the modulated prose of her grandfather, Susan Eisenhower has compared the metal tapestries that take up so much of the proposed Eisenhower Memorial to the gigantic, Communist-era art that honored Marx and Lenin. “We now believe that a redesign is the only way to make this memorial acceptable to the American people,” she told a congressional committee. We should not be surprised by the battle over the Eisenhower Memorial. The building of our national memorials has traditionally been a source of bitter controversy that is quickly forgotten once the memorials open to the public. Few outside of the architectural community remember that Maya Lin’s 1982 Vietnam Veterans Memorial, at which vets and their families now regularly leave flowers, was once derided as “a black gash of shame and sorrow”. There is, moreover, a solution to the Eisenhower Memorial controversy that should help us break the current deadlock. We need to simplify the memorial’s design – with its tapestries, columns, and multiple statues – by modeling it on the precedents set by the two most successful memorials on the National Mall: the Lincoln Memorial of 1922 and the Jefferson Memorial of 1943. The trouble with the proposed Eisenhower Memorial is not with any single design element, but with its attempt to tell Ike’s life story by going as far back in time as his Kansas childhood. It is as if the Lincoln Memorial did not feature Daniel Chester French’s massive, white marble Lincoln brooding over the country during the civil war but consisted instead of a series of smaller sculptures that took us from Lincoln’s youth as a rail splitter, to his 1858 debates with Senator Stephen A Douglas, to his assassination at Ford’s theater by John Wilkes Booth. Each of these separate Lincolns is worth considering, but honoring them in one memorial would have been a distraction. A memorial is not a biography in stone. A memorial’s task is not to sum up a life, but to capture the essence of a life in a unified, powerful image. Thus, in Henry Bacon’s neo-classic Lincoln Memorial, Daniel Chester French’s seated Lincoln personifies the essence of Lincoln’s presidency – and avoids the narrative detail the Franklin Delano Roosevelt Memorial insists on by bombarding us with endless quotes and requiring us to walk through four open-air rooms that correspond to FDR’s four-term presidency. 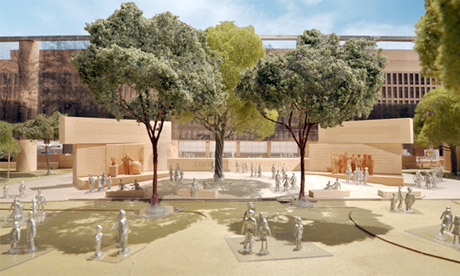 The Eisenhower Memorial presents us with a chance to apply the Lincoln Memorial design approach to Ike, and in Frank Gehry’s proposal, we even have a sculpture concept that would work. The sculpture I refer to is one based on Ike’s meeting on the evening of 5 June with the paratroopers from the 101st Airborne Division, who were scheduled to drop behind enemy lines just before the D-Day invasion began on the beaches of Normandy. The determined, but worried Ike whom we see at this turning-point in history is a general balancing his obligations as a commander with a personal tenderness he will not put aside. He is the opposite of an Arthur “Bomber” Harris or a George Patton. This is the complex figure Americans twice elected elected president: the soldier who won the hearts of those who served under him. And if a single statue of Ike, along with a small pavilion, seems too modest for the four-acre site south of the Mall that has been set aside for the Eisenhower Memorial, there is always the smaller, open space around the national second world war memorial. 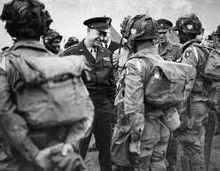 Ike was a general who took enormous pleasure in keeping company with the men he led.